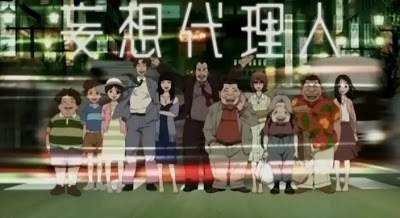 In light of the recent death of one of my all-time favorite anime directors Satoshi Kon, I wanted to spend my blog post sharing some of his work. 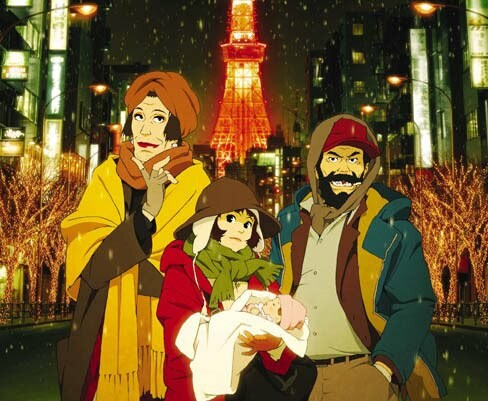 Satoshi Kon, veteran director at the Madhouse ltd., is the mastermind behind the groundbreaking new-age anime films Paprika and Paranoia Agent, as well as the critically acclaimed psychological thrillers Tokyo Godfathers and Millenium Actress. Arguably, Satoshi Kon's dramas are just as powerful both aethetically and dramatically as some of the anime directors best known to the Western world including Hayao Miyazaki and the ancient Katsuhiro Otomo. Aesthetically, scenes from Kon's films are typically colorful and visually effective. Kon's later films layer backgrounds and lighting to create papery u-kyoe effects, heavy silhouettes, and colorfully illuminated streets and sky lines. 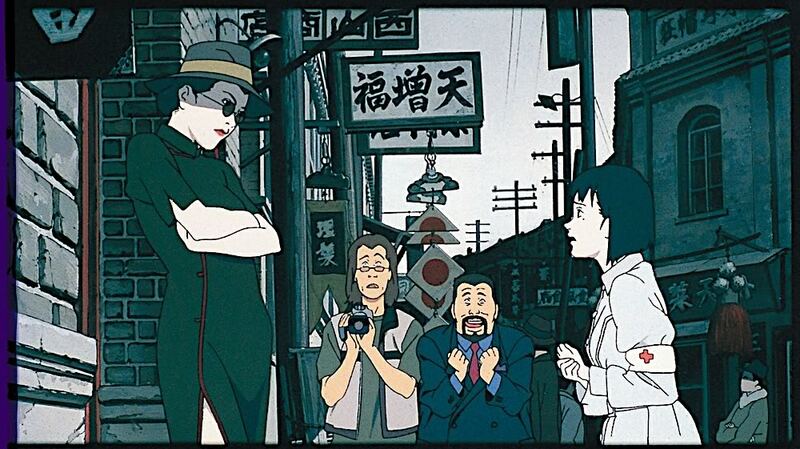 Story boards for Kon's films are often drawn entirely by Satoshi Kon himself. In addition, Satoshi Kon often uses variations in traditional anime drawing such as simple flattening colors/color texture, transparency, and brightness to transition between alternate realities and shifting moods in more recent films like Paranoia Agent and Paprika. 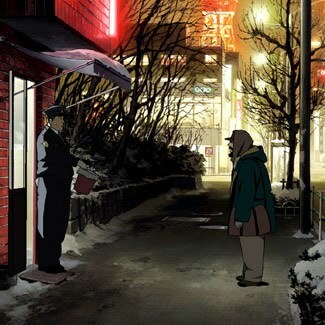 In these films Kon pushes some of the boudaries in drawing by illustrating impossible shape shifting between an objective reality and the worlds of dream and cyber life. 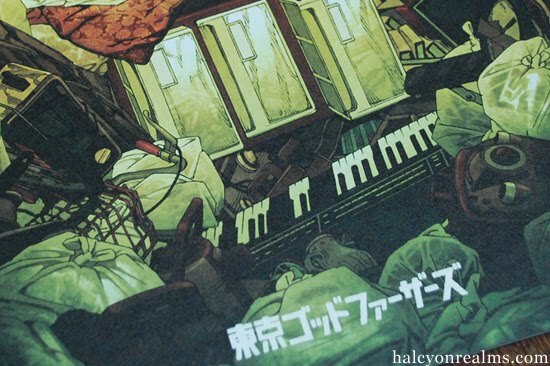 Satoshi Kon's work also has a challenging level of depth and irony that bring to life the characters and world he creates. 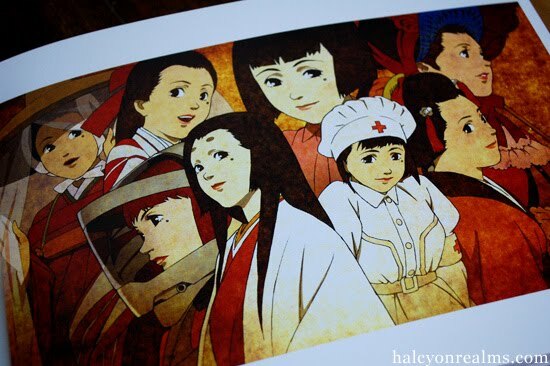 One of my favorite examples of this is in Satoshi Kon's Millenium Actress, where Kon revists in his own work, the history of World War II actress Chiyoko Fujiwara. Here, Kon adopts the traditional cinematic styles from WWII Japan to show the life and film journey of the actress. The centerstage of film is Chiyoko Fujiwara herself, who chases an unknown man through movie after movie, each time essentially playing out versions of her own life/search through different film mediums. This past week has been pretty "artsy" in terms of cultural art and music exposure. I had a few productive a cappella practices, went to the Muse concert, spent a lot of extra time in the Smith warehouse catching up on work, went to the Passion Pit concert, watched Into the Woods, signed up for a spot on the Perkins mural, and registered for an animation class for next semester. So, instead of writing a feature on an artist in particular, I feel like just sitting down on this brisk pre-Halloween festivities afternoon and typing up an informal blog post. Hope you don't mind my ramblings. So, we had our little individual discussions with Prof. Fick this past Friday and I voiced my primary worries about drawing with traditional mediums. As you may or may not know, this is my first formal art class and, prior to this, I have never even touched charcoal. It has been such a challenge trying to familiarize myself with the tools of the trade as well as the sheer size of the drawings. I mean, seriously, I can barely fit a standard 8.5x11" page much less these giant bristol boards! Utilizing all that space has definitely been something of an obstacle I've been grappling with. Basically, this process has been my tried and true method for a lot of these little hobby pieces (1|2|3|4), with a little bit of painterly expression in between. I think it's interesting how challenging/tough it is to translate this method to traditional mediums like charcoal with paper. I supposed right now I'm just frustrated with how to find a way to draw "cleanly" without compromising fluid lines and tonal depth. I think the main challenge for any artist, professional or amateur hobbyist, is to find a medium that they love to work with. Alexa Meade has found that medium through, I'm sure, a lot of trial and error experimentation. I guess part of that process is to play around with a lot of different methods -- be it sculpture, paints, watercolors, charcoals, etc. Thus, I think that this Drawing 100 class has been an enlightening experience. It has challenged me to find new ways to work with new tools and, hopefully, I'll find a way to achieve expression without compromising line fidelity through charcoal and graphite. Circle Limit III, 1959. Woodcut, second state, in yellow, green, blue, brown, and black, printed from five blocks. M. C. Escher, whose full name was Maurits Cornelis Escher, was born on June 17, 1898 in Leeuwarden, Netherlands, and died March 27, 1972 in Laren. He was a graphic artist best known for his realistic prints that played with weird optical and surreal effects. He used lithographs, woodcuttings, and engravings to portray "impossible" spaces. In 1919, he attended the Haarlem School of Architecture and Decorative Arts. He began studying architecture, but then switched to decorative arts, where he studied under Samuel Jessurum de Mesquita. One of the reasons he turned to art was that he felt images were the best way for communicating his ideas to other people; they were graphic, not literary, concepts. He left the school in 1922 and traveled through Italy and Spain. He met Jetta Umiker in Italy and married her later in 1924. They lived in Rome until 1935, when the political tension caused by Mussolini drove them to leave for Switzerland. They had a son in Rome, named Giorgio Arnaldo Escher. They moved again in 1937 to a town near Brussels, but then, in 1941, World War II forced them to move to the Netherlands, where Escher remained until 1970. Most of Escher's more famous works come from this period. In 1970 he moved to a retirement home for artists in Laren, and he died there in 1972. His art is also known for its unique mathematical qualities, and his work in fact has influenced the field of mathematics. He portrayed mathematical relationships between figures, places, and space. One of his greatest mathematical interests was in regular division of planes and symmetry. Escher was influenced by George Polya's academic writings on plane symmetry groups, which his brother, Berend, sent to him. This inspired Escher to more heavily incorporate mathematics into his art, starting in 1937. In 1941, Escher wrote his own paper, Regular Division of the Plane with Asymmetric Congruent Polygons, detailing his mathematical approach to art. In this paper, he studied color-based division, and developed a system of categorizing different combinations of color, shape, and symmetrical properties. This area was later labeled crystallography by mathematicians. Escher also experimented with other mathematical concepts in the 50s, such as representing infinity on a two-dimensional plane. 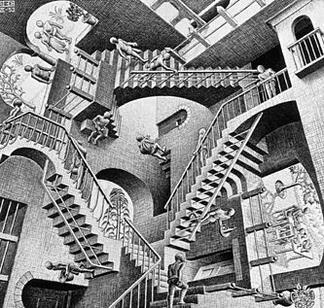 I was interested in Escher's art because it portrays an "alternate" reality in which the laws of the world we live in don't seem to apply. I always felt that one of the most beautiful qualities of art was that it could be used to distort, skew, and create new worlds. I think Escher's application of math to art is intriguing because, so often, they are viewed as being opposites, with math as a rational force and art as an irrational, emotional one. Thus, his combination of the two brings a fresh perspective to art. Maurits Cornelis Escher. M. C. Escher: The Graphic Work. Taschen, Germany. 2001. "M.C. Escher." Encyclopædia Britannica. 2010. Encyclopædia Britannica Online. 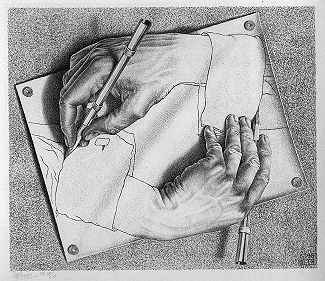 28 Oct. 2010 <http://www.britannica.com/EBchecked/topic/192344/M-C-Escher>. I have an affinity for paintings with music or musicians as subject matter, so I started out looking for an artist who shared my fascination with this art-within-art theme of music in painting.